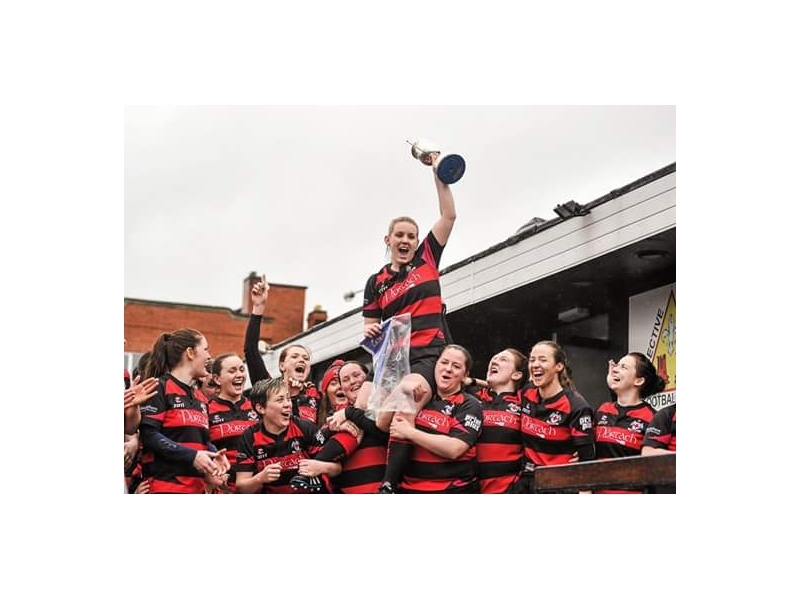 The Tullamore ladies were crowned Bank of Ireland Leinster Womens League Div 2 champions on Saturday afternoon in front of a large crowd in Donnybrook. Considering that Tullamore had only conceded 18 points in the 11 league games to date, the 15 points scored by CYM show how much of a better standard was on display with this performance. The other side of that coin, is that if CYM upped their performance, the Tullamore also had to increase their own standards, and indeed that is exactly what happened, resulting in a very exciting and skillful game. Tullamores preparation had gone well, and the management team were quietly confident in the warm up. CYM however came out of the blocks like a greyhound out of the trap, and attacked with speed and strength. Tullamore made all the right decisions when they had the ball in hand, but CYM had more of the ball and so dominated the opening period of play. They scored a try through their influential Out half after 7 minutes, which was also converted. Tullamore came back well, and were unlucky not to get a penalty try, when Brigid Hyland was pulled back off the ball, as she was about to touch down a kick through for a try. The CYM player was yellow carded, and Tullamore choose to run the penalty, but stout defence from CYM kept them out. The next score came after 20 min when CYM slotted a penalty to take a 10-0 lead, and all of a sudden Tullamore found themselves in unchartered territory, It was the first time in a competitive game all year where they were more than a score behind, and their belief must have been tested. Jill Draper came up trumps though, as she squeezed over for a try after 25 min which was converted by Pauline Keating. This try was just reward for Jills fine individual performance. Along with Katie Murray, Emer Phelan and Captain Roisin Feighery they kept the CYM girls out on numerous occasions, and indeed Tullamore were relieved to get to half time just 3 points down. If ever the cliché “A game of two halves” was true, then it was on Saturday. Tullamore were fired up, and feeding of the hurt caused by last years defeat at the same stage. The leaders on the team stood up, and really took the game to the Terenure girls after the re start. 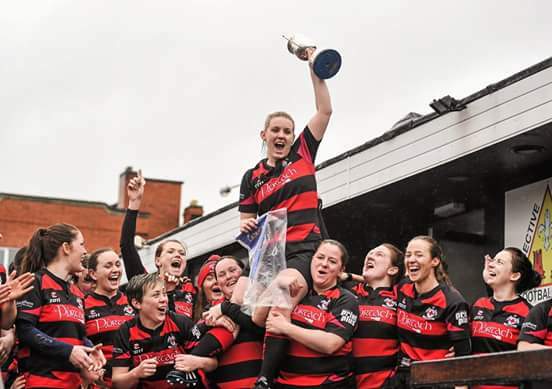 Strong caries from Claire Currams, Grace Flynn and Pauline Keating, put the Tullamore pack on the front foot, and Nichola Fryday, Katie O Brien and Evelyn Browne kept the charge going. This period of the game was dominated by Tullamore, and when CYM tried to clear their lines, Claire Cantwell and Rose Dunne returned the ball with interest, and piled more pressure on CYM. 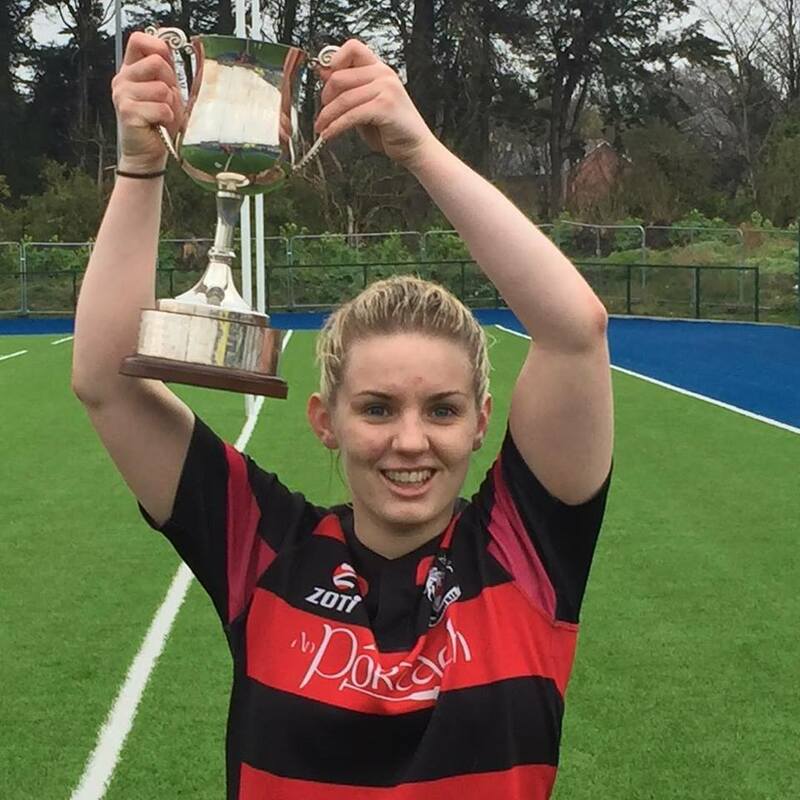 It took until the 72nd minute however to finally get over the line, when a reinvigorated Chloe Lowry could not be denied, after being re-introduced to the field 2 min previously. Pauline duly kicked the conversion, and now Tullamore were 4 points in front and the excitement was really building. CYM fought back like the class team they are, and it was only Tullamore dogged determination that wouldn’t let them back in the game. A penalty, 40 metres out led to a hard decision whether to kick for touch or kick for the posts, which Pauline took upon her shoulders. The points were kicked, and Tullamore had a 7 point lead with 7 min to go. The adrenalin was really flowing in both sides now, as CYM were determined not to be denied. The last play was eventually called, with a scrum to CYM outside the Tullamore 22. For 5 min, which felt a lot longer, CYM battered the Tullamore defense, knowing any mistake would finish the game. Eventually they scored in the right hand corner and everybody was as nervous as a politican on polling day, waiting for the conversion attempt. The conversion was narrowly missed, and the final whistle blew, setting off the Tullamore celebrations. Jill draper was named as Most Valuable Player on the day, an accolade which she well deserved. Not only for her skill on the day, but her never say die attitude which was taken up by the whole team. As Jill was quick to point out, Saturdays victory was not built on one persons performance. The win was the result of the hard work put in by the whole squad over the whole season to date. So where to next? Well, Tullamore are in the Cup quarter final on Sunday in Spollanstown, and you’d never guess who the opponents will be – CYM. Yes, that’s right, a rematch is on the cards, and for anybody interested in seeing 2 highly entertaining sides battle it out, you know where you have to be next Sunday. If the game is half as good as Saturdays it will be well worth watching. 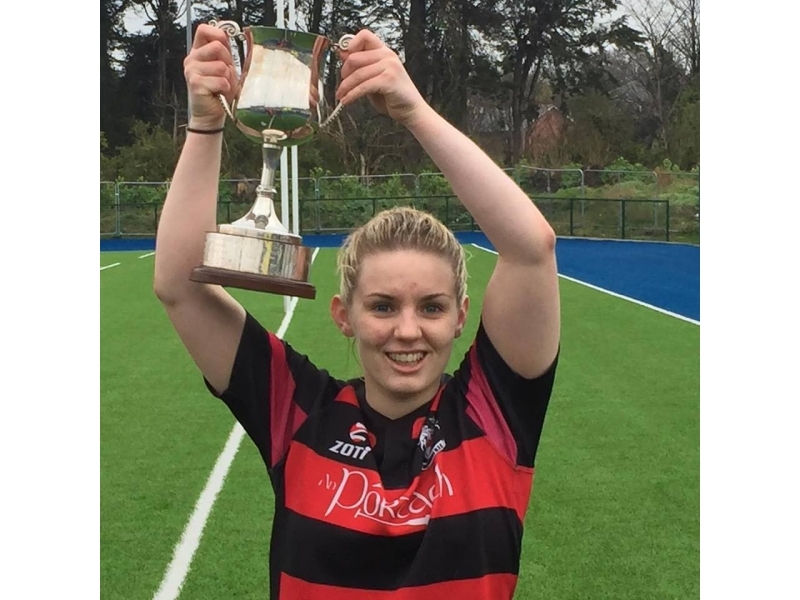 The team and subs were: Ciara Farrell, (Alma Egan, 50) Evelyn Browne, Vicky Cobbe,(Kate O Brien, 30, (Ciara Farrell, 70), Katie Murray (Chloe Lowry, 70), Nichola Fryday, Chloe Lowry (Lauren Keenahan, 40), Roisin Feighery, Emer Phelan, Brigid Hyland, Jill Draper, Rose Dunne, Pauline Keating , Grace Flynn, Claire Currams, Claire Cantwell.